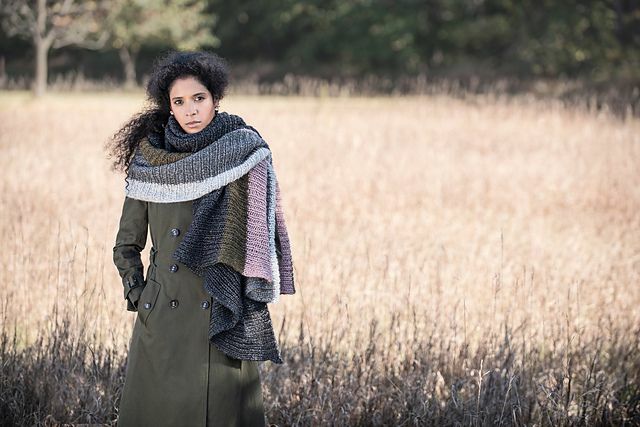 Cozy up with the Tamarack Blanket Shawl by Virginia Sattler-Reimer. The generous ribbed knit may be worn as a large wrap or used as a throw on a chilly evening. Also perfect for chilly movie theaters & restaurants! Match the colors shown in the sample or choose your own knitting adventure. The piece is knit with meltingly soft Blue Sky Fibers Techno, a light, split resistant yarn that really blooms after blocking. The only supplies needed are size US 13, 40” or 60” circular needles, 12 skeins of Blue Sky Fibers Techno bulky weight yarn, & a darning needle. Enjoy shopping our store or selecting your supplies on our website. It is always our delight to offer free shipping & complimentary ball winding.